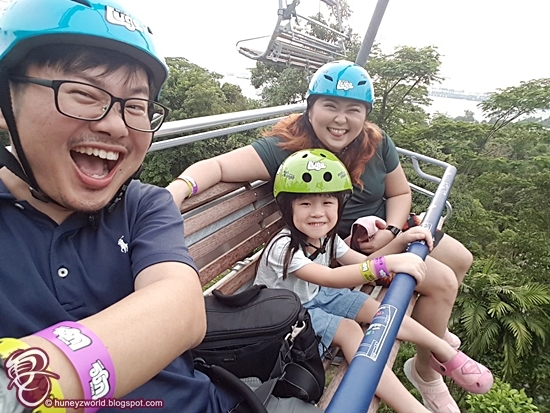 We had A Great Time Speeding on The Luge And Enjoying A Bird's Eye View of Sentosa! I have had a great deal of fun racing with yours truly Queen Bee at Sentosa recently, during our tryout of the additional two new Luge tracks and a new Skyride! 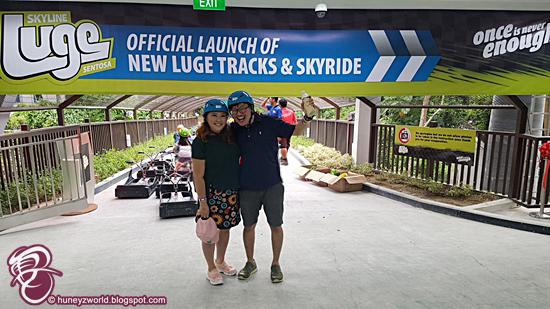 This is part of the SGD14 million update for Skyline Luge Sentosa by diversified tourism company Skyline Enterprises to enhance the ridership experience and reduce waiting time at the its first Luge in South-east Asia. 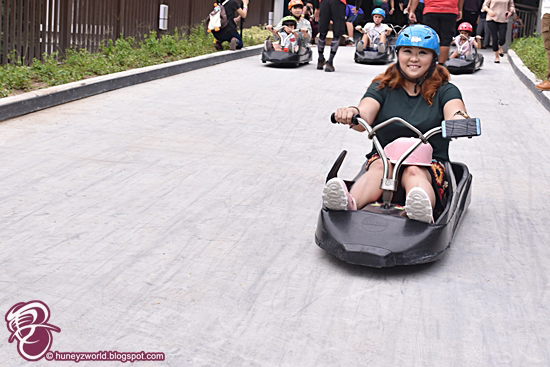 For Huneybees who are not familiar with Luge, its an unique wheeled full-filled gravity ride which provides riders full control over their descent on a purpose-built track and is safe for all ages. The starting point of the Luge is located at the Imbiah Station, where the riders can take their pick among a variety of Luge tracks. 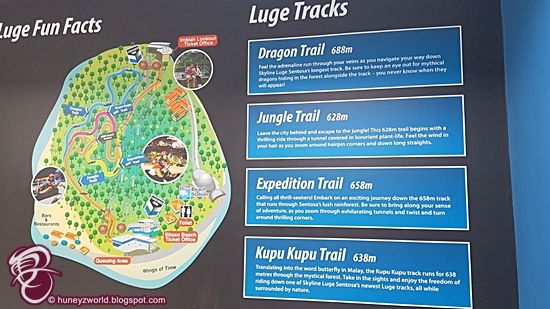 In addition to the existing Jungle and Dragon trails, riders can dive into the two new brand Luge tracks that twist and turn through the mystical forest. 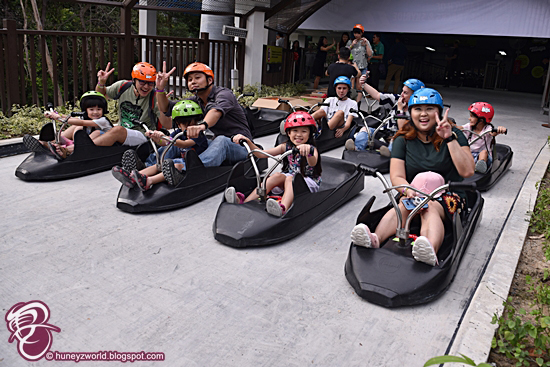 Specially designed with hairpin corners, long straight and exciting slopes, riders can now look forward to an experience to remember with their family and loved ones as they zoom down the four tracks (2.6 km in all). The new tracks are the 658 metre long Expedition and 638 metre Kupu Kupu, which means “Butterfly” in Malay. The names are from a contest where Skyline Luge Sentosa fans and supporters submitted suggestions. After trying both the new and old trails, both the Queen Bee and myself agreed unanimously that the Expedition Trail is the most exciting among them all, because of its many hairpin corners along down slopes that reminds me of Formula One and The movie Fast and Furious for her! At the end of each Luge ride, we will be ferried back to the starting point by the new Skyride that offers a scenic free-top adventure on a 4-seater chairlift. 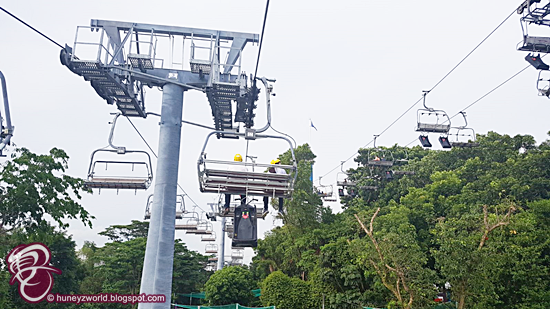 Spanning across 315 metres, the new Skyride gives riders a bird’s eye view of Sentosa, the Singapore city skyline and the South China Sea of up to 16 metres above ground. Riders can look forward to enjoying the breeze and feeling the wind on the 7 to 9 minutes long Skyride in mid-air. Be warned that this could be a-bit scary for those (eg. Queen Bee...) who has acrophobia or fear of height! To celebrate the launch of the new tracks and Skyride, local residents can enjoy $3 off 4 Luge & Skyrides combo (usual price: $28 per pax) from now till 31st December 2017. They can enjoy the promotion by flashing their Identity Cards at the Skyline Luge Sentosa’s ticketing counter for verification purposes. Each resident is entitled to one redemption. 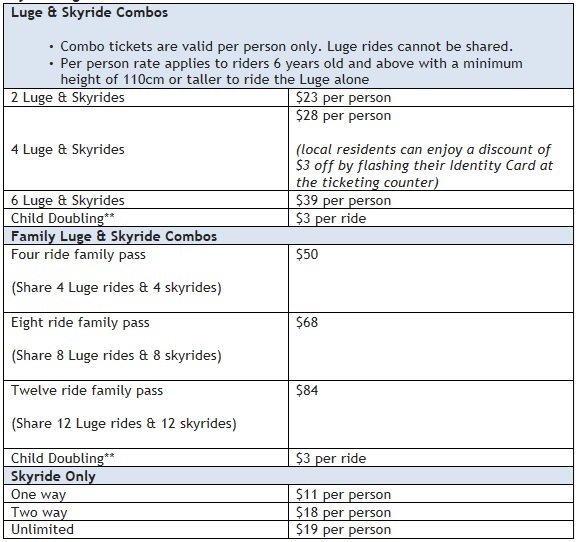 Skyline Luge Sentosa will also be setting aside 700 tickets (2 Luge + Skyride Combo) worth up to $15,400 to local charity and community organisations. The relevant organisations may write in to Skyline Luge Sentosa to request for the tickets. 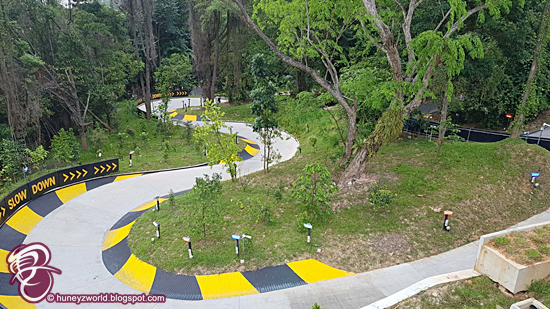 Last but not least, for Huneybees who choose to drive or ride into Sentosa for this exciting and enhanced playground, you could park at the relatively unknown open space carpark that is 3-5min walk from Imbiah Station, instead of the popular carpark at Beach Station. The new Skyride and Luge tracks offers a local adventure like no other!